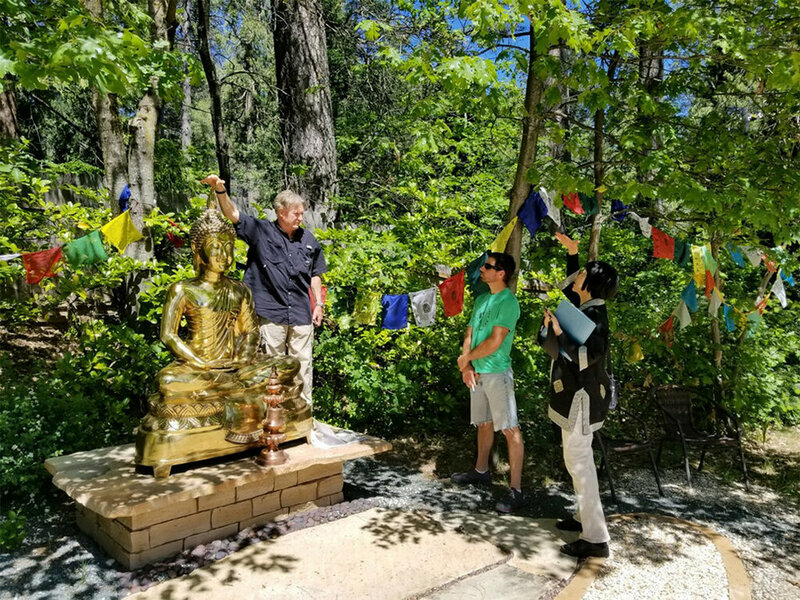 The shiny brass Buddha that now occupies a prominent stone pedestal in the back yard of the Nevada City Insight Center was a generous gift from our Founding Teacher John Travis. John acquired the statue from a foundry in Thailand in the Spring of 2016. The Buddha statue left Bangkok packed in a sturdy handmade wooden crate and began its three month ocean voyage, touching US soil once reaching the international port of Los Angeles. After another couple weeks it went through processing and customs before heading up coast to San Francisco. Finally, an overland truck brought Buddha safely home to Mountain Stream’s parking lot, completing this four month trip. Our next task was to move the 500 lb statue to its final destination…across a large grassy yard to his/her resting place on west side of the Mountain Stream labyrinth. It took an engineer to figure all that out! Rick and Ann Dondro managed the feat by rolling the Buddha on a series of logs, and then orchestrating the last part of Buddha’s journey by slowly and ever so carefully using pulleys and wood to inch Buddha into place. What an extraordinary feat of mindful engineering. 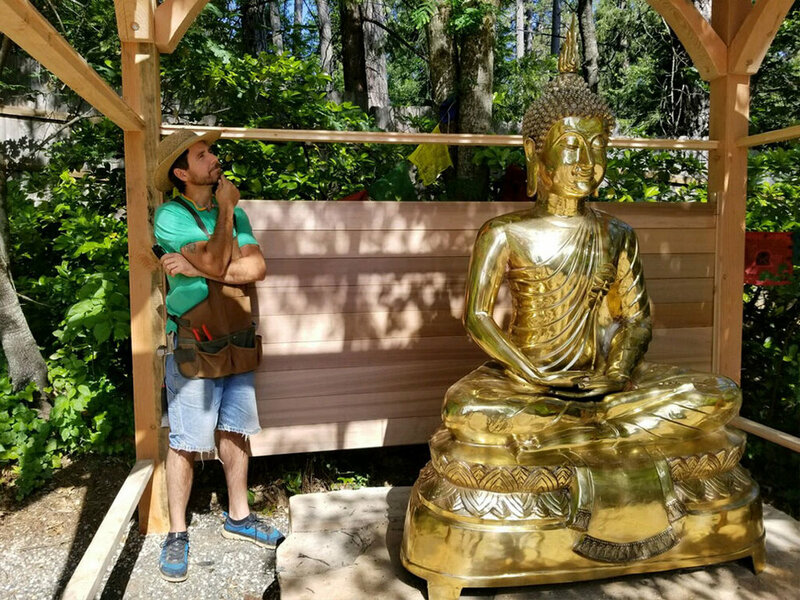 “I feel we need a structure to protect the Buddha in this beautiful garden just like we are nurturing our own Buddhahood within.” Charlotte asked her dear friend and artist/contractor David Montignago to design and build the temple. Within a few short weeks and with the help of willing volunteers (Rick Dondro, Tosho Henninger & Gabrielle Boulard), David finished this unique Craftsman-esque structure: our new Buddha Temple! Now, there is one last finishing touch to be done. John gave Mountain Stream another Asian treasure he found in Nepal many years ago: a copper stupa. This will be installed on the roof top of the Buddha’s Temple this Fall. That will be the crowning jewel completing the temple project. Our sincere thanks to the many hands that have cared for and welcomed Amitabha Buddha on its journey home. We invite you to visit our backyard garden with labyrinth and Buddha Temple. You are welcome to come and enjoy this refuge with us! Snow on the labyrinth. Buddha is in place and just needs a temple.